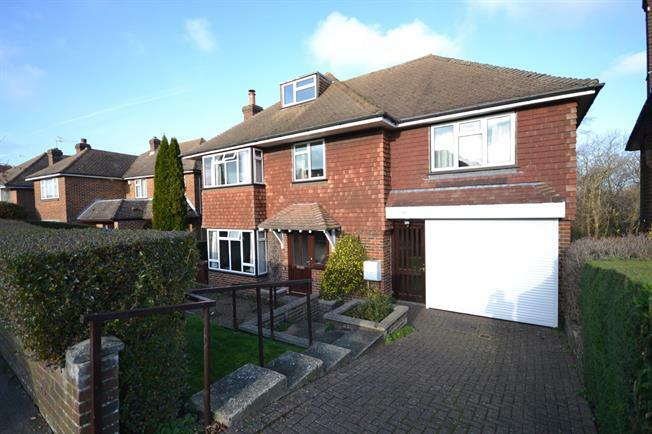 4 Bedroom Detached House For Sale in Tunbridge Wells for Guide Price £650,000. Freeman Forman are delighted to present this substantial and extended four bedroom detached family home, boasting a delightful rear garden which backs directly onto woodland. The property benefits from a ground floor extension offering excellent entertaining space. The accommodation includes an entrance hall, sitting room, dining room, kitchen/breakfast room, cloakroom and access to the integral tandem double garage with electric remote controlled door. Stairs rise from the entrance hall to the first floor landing with loft access, there are four double bedrooms located on the first floor, one of which benefits from a shower cubicle. Also located on the first floor is shower room with a WC and wash basin. The property benefits from an attic room with a window which is accessed via a drop down ladder. The accommodation has a gas central heating system and double glazing. Outside to the front of the property is a driveway for off road parking and a hedge enclosed front garden. There is a useful workshop/garden store which is underneath the property and is accessed via the rear garden. The rear garden is a particular feature of the property and is laid mainly to lawn with attractive plant/flower borders and a summer house. An internal viewing comes highly recommended.